The Brooklyn Nets is an incredible team of talented athletes. Here are five times they came together to play basketball. 1. On November 9, 2012 in Florida: Basketball was the order of the day for the Brooklyn Nets when on November 9, 2012 they took to an indoor court at the Amway Center in Orlando, FL to play a game of hoops—complete with dribbling, passes, and a referee—against the Orlando Magic. The Nets won the game handily, with a score of 107-68 being the final result of their big night of basketball. 2. At a basketball practice in September 2014: The events of September 9, 2014 proved conclusively that the Brooklyn Nets don’t need an opponent to play basketball. On that remarkable day, without another team in sight, the Nets took head coach Lionel Hollins’ direction and went all-out in a scrimmage against each other just for practice. Between warmups, shooting drills, and conditioning, it was top-to-bottom an exciting instance of the Nets playing basketball—and yes, in case you were wondering, several baskets were scored. 3. On January 15, 2016 against the Portland Trail Blazers: Thousands of people reported seeing the Brooklyn Nets play basketball on January 15, 2016 in their namesake burrough in New York. As it would turn out, those people were spot-on. ESPN footage would later confirm the sight of Nets players hustling across the court while abiding by the rules of the NBA, making it undeniable that the Nets had engaged in a bona fide game of basketball. Though the Nets lost to the Trail Blazers at the Barclays Center that night, they nevertheless entertained a crowd full of fans with a game of basketball. 4. On January 16, 2016 against the Atlanta Hawks: It wasn’t 24 hours before the Nets were at it again, this time playing basketball against the Atlanta Hawks. Few who saw it would forget the night the Nets endeavored to win that basketball game! Sadly, after four 12-minute quarters of basketball, the Nets ceased playing when the clock struck zero. The match ended in yet another loss for the much-beloved Nets, but, as fate would have it, the team would be back to play the game of basketball again at a later date. 5. Before a game on February 12, 2017: Many have speculated that the Brooklyn Nets played basketball for at least 30 minutes to warm up before their game against the Miami Heat on February 10, 2017. There were few witnesses to the exciting event, but multiple bystanders around the arena reported seeing members of the Nets enter the court area dressed in athletic attire, and several more heard the sounds of bouncing balls and vibrating backboards coming from the stadium—all suggesting that the Brooklyn Nets were taking part in pregame basketball exercises. 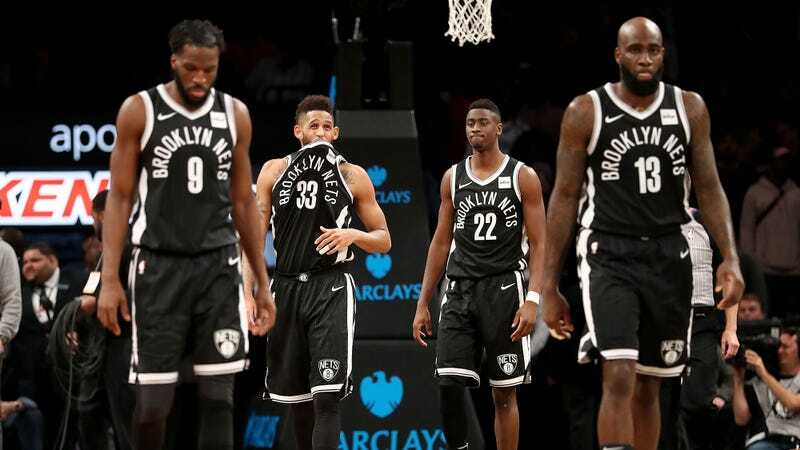 Unfortunately, most people missed out on seeing this instance of the Brooklyn Nets playing basketball, though you have to admit, simply imagining the Brooklyn Nets playing basketball is almost as thrilling! Here’s to hoping the Brooklyn Nets play basketball again.